(CNS): Former senior police officer and local sports personality Derek Haines raised more than $34,000 through sponsorships and donations for the Intertrust Cayman Islands Marathon last year in order to buy a vehicle for HospiceCare. Keys to a brand new Ford Escape were recently turned over to the centre after Vampt supplied the car at cost and government waived the duty. A surplus of $12,000 was alsopresented to Cayman Rugby for its youth development programmes. “I am extremely grateful to all those who have so generously supported this worthwhile cause,” said Haines, a long-time Rotary member who has been running marathons since 1982. “HospiceCare does such a great job helping people who are terminally ill, as well as providing comfort to the family. It’s a charity I have some personal contact with, including friends and fellow Rotarians who suffered from cancer,” he added. HospiceCare Operations and Fundraising Manager Jennifer Grant-McCarthy said the donation of the vehicle has been a great boost to the organization. This year, Haines, senior manager of security at Dart Cayman, will be running the 26.2-mile marathon in December to raise funds for the Cayman Islands Cancer Society that will be earmarked to assist with fitting out a chemotherapy facility. 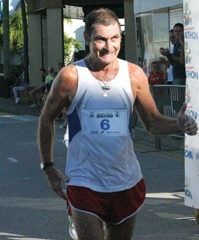 Haines previously raised $67,000 in the 2010 marathon, which bought a new bus for Cayman’s Special Olympic athletes. Cayman HospiceCare is a not-for-profit organization that provides palliative care free of charge to anyone with cancer or other end-stage illnesses. Specialty nursing staff manage pain and other symptoms, and attend to the well-being of both patient and family.